With DePauw University political science professor Bruce Stinebrickner (left) listening intently former three-term Greencastle Mayor Nancy Michael (center) tackles a topic during a program featuring the last four mayors of the city. Also on the panel are Mike Harmless (second from left), Sue Murray and Bill Dory. Perhaps not since Frank Valli, his falsetto and the Four Seasons has anyone hit the high notes better than the last four mayors of Greencastle in their recent panel appearance at DePauw University. The brainchild of DePauw political science professor Bruce Stinebrickner, the two-hour mayoral event earlier this month was interesting, insightful, funny and a great reminder of how far we've come as a community and how we've gotten there. And like any good bit of entertainment, it left me wanting more. 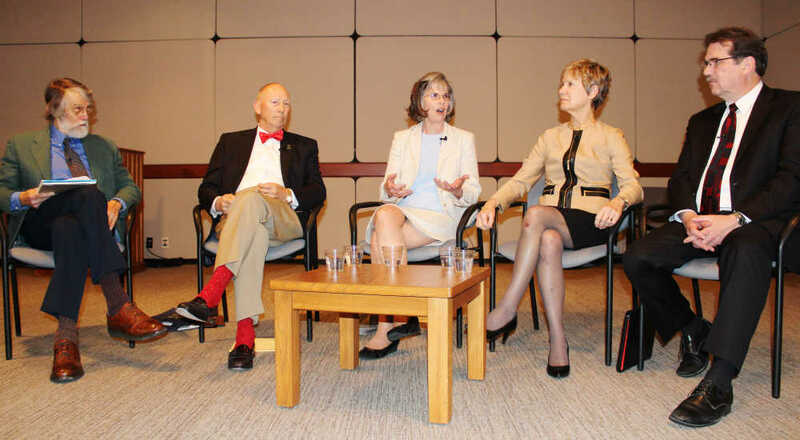 It came off as sort of an Inside the Actors Studio meets Meet the Press effort with Stinebrickner in a James Lipton-meets-Tim Russert moderator role, tossing questions the way of former Mayors Mike Harmless, Nancy Michael and Sue Murray and current Mayor Bill Dory. The four shared heartbreak, humility and humor in a way rarely seen from local officials, past or present. And when it was over after two hours, some of our brains were already working overtime, contemplating a sequel. Or a series of encores. How about the four prosecutors, Stinebrickner suggested off the cuff. And while "the Four Prosecutors" sounds like some sort of Marvel Comics creation or a really bad heavy metal band, there are indeed four living Putnam County prosecutors who might share old war stories and new concerns. There's current Prosecutor Tim Bookwalter, his immediate predecessor, Matt Headley, along with Robert Lowe and Del Brewer. Should be a few tales to tell there. Heck, with all that lawyering, there's bound to be a John Grisham book in that mix. Of course, there could also be a panel of the last four superintendents Greencastle Community Schools. Imagine that. That would be current GCSC Supt. Jeff Hubble, Dawn Puckett, the controversial Lori Richmond and Bob Green. Heck, this panel could go six deep if they could get Mike Turner and lure Jim Renz back from Florida. Imagine the fun though with Stinebrickner having served on the school board when some of those folks were in charge. Rest assured this one will never happen. Meanwhile, trying a similar idea with four DePauw presidents sadly comes up short. You certainly could get current President Mark McCoy, predecessor Brian Casey and longtime DPU boss Bob Bottoms. However, Bottoms' predecessor, Richard Rosser, passed away in 2007. And did someone say Banner Graphic newspaper editors? Sure, we could do that. Besides yours truly, we would have Jamie Barrand and Lisa Meyer Trigg and ... oh, yeah, me again as a bookend. Of course, I could clone myself to make that happen. Seems like I need to do that almost on a daily basis anyway.